The route has an interesting history. It started in the 1800’s when Bennie’s ancestors and their sharecroppers dragged bundles of Wild Plum wood straight down the foothills of the Swartberg Mountains to distil Witblits and to make raisins. During wintertime the sharecroppers also sell the wood in town for an extra income. Most of the route is in these drag paths or in the wagon trails along the lower lying areas where they loaded the wood on ox wagons and donkey carts. Originally the veld was infested by prickly pears till cochenille (a pest on prickly pears) was imported from Australia to get rid of it. A lot of wild donkeys were also roaming the Gamka river valley. Since then the Spekboom and other plants have taken over and nowadays it is one of the finest succulent areas in the Karoo with a large diversity of plants being found in such a small area. In spring the veld is a carpet of wild flowers and in the distance is the imposing and sombre backdrop of the smudgy blue Swartberg Mountains. 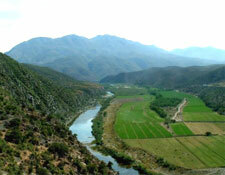 The trail runs through and along the Gamka river with its spectacular views. The river crossings can be very interesting especially when the river is in flood. 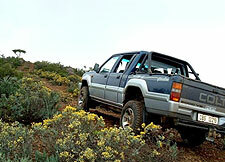 For most of the trail you will need a vehicle with a low range of gears. The trail is people and vehicle friendly and is great fun and a tremendous experience for the whole family. Like photographer, Richard van Ryneveld said: "A truly beautiful area, Matjiesvlei a hidden and undiscovered gem in the Klein Karoo." 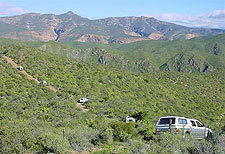 It is easy to get to - approximately 13 km out of Calitzdorp (15 minute drive) and only 3 - 4 hours from Cape Town and P.E. Mountain bikers can use and enjoy most of the trail. We find that many people also like to hike the route. At the end of the drive you can relax and socialise at The Dam River Campsite or in one of the three self-catering chalets with bedding and towels provided and fully equipped kitchens. The spacious campsite is shady and well grassed offering privacy at each site as well as an ablution block with showers (donkey boiler) and toilets. At the campsite and along the banks of the river there is a rich variety of bird life including black eagles and fish eagles. Sometimes if you're lucky Cape otters can be spotted. The river contains about seven different fish species so bring along your fishing rods and inflatable boats if you enjoy angling. When visiting us we would recommend that you bring along, binoculars, fishing rods, mountain bikes, hiking boots, canoes or inflatable boats and swimsuits. Nearby, Calitzdorp is a lovely and fascinating town to visit. It has good restaurants and wine tasting venues. 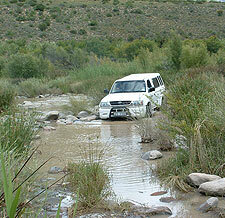 From Matjiesvlei you can also go on day trips to several places of interest in the Klein Karoo.